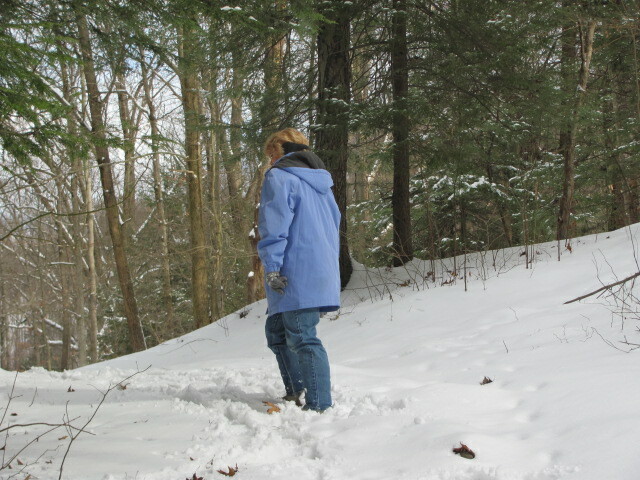 After church services, Laurie and I dressed for a winter hike and headed for the “Buttermilk Falls Trail”. This trail parallels Cowanshannock Creek in Armstrong County, Pennsylvania. This section I am guessing to be about 3 miles both ways. The creek is fast water pushed through very huge boulders. The waters hold bass; suckers; trout; carp….anything willing to swim up from the Allegheny River. The trail is encompassed with hemlocks and rhododendron plus big oak and wild cherry; beech and birch. Old coal mines from long, long ago are present higher along the hill. 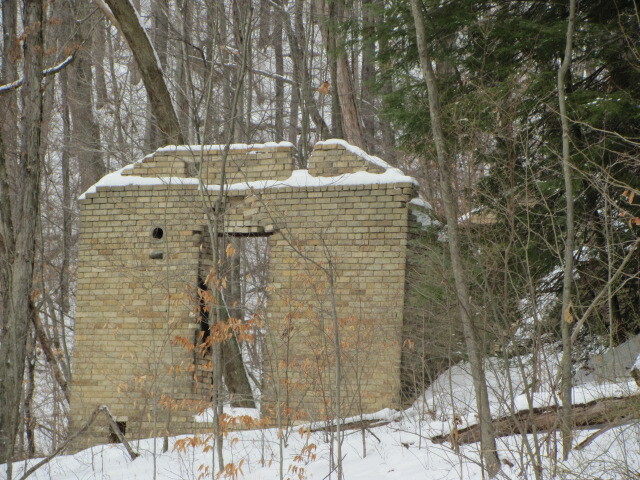 An old brick building, maybe I should say the remains of an old brick building, is set above the trail. A couple of bridges can be crossed to witness the creek or a rock-laden spring flow. The deer were actively using the trail in search of fallen acorns. A lot of blood was present along one set of tracks. I wonder what may have happened to this deer to allow this much flow to occur. Coyotes? Fall over rocks? Regardless I hope the deer survives. I enjoyed some exertion on a coyote hunt-hike this afternoon. 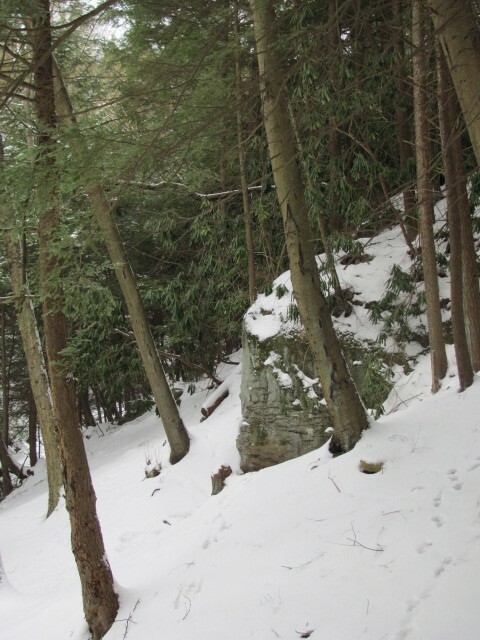 I walked about the Limestone Run area of Armstrong County, Pennsylvania. I did see some coyote tracks, but I failed to call any in to me. Most tracks were old, however, some may have been made the previous night. Coyotes are notorious for being travelers. Also, this is their “courting season”, so I suspect their distance of travel will increase as needed to find a “spouse”. I sat and called at three sites for about 15 minutes each. The time afield was primarily just a chance to get to the woods. While walking along a noticed a single turkey about 200 yards ahead of my approach. I correctly assumed more would be present. Tracks and scratchings told me of a sizable flock. I peered over the hill and didn’t see any turkeys. Suddenly, the woods exploded with, at least, 25 turkeys. The birds were on a bench out of my sight. One bird glanced over and announced an escape. I manged to get one photo during the chaos. The photo was blurred. I found at two different sites porcupine tracks and trails. I searched hemlocks for any sight of one, but failed to locate a “porky”. They could have been in their holes as the trails all headed to holes and rocky outcrops. 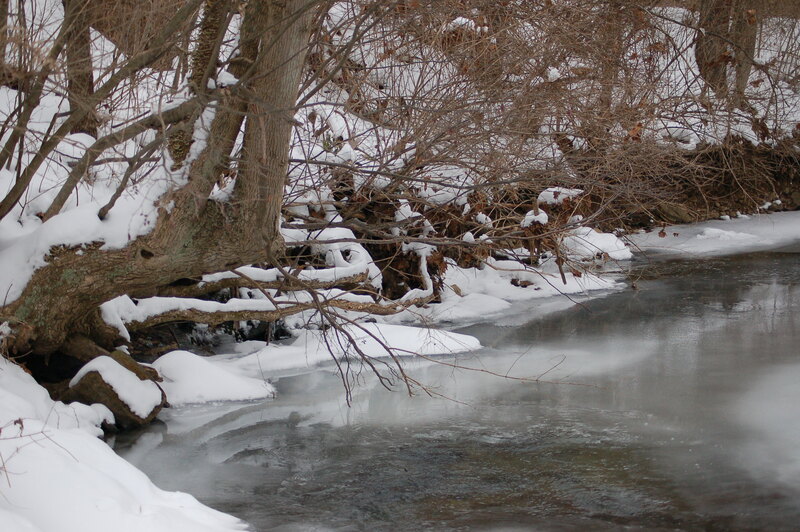 Limestone Run was predominantly frozen over with a few exceptions. I cautiously walked across iced over areas with success. The snow began to fall in earnest about 4:00 in the afternoon. What a beautiful sight! Other critters I was blessed to see were one squirrel; a red-tailed hawk, another hawk I didn’t get to positively identify; many small birds and crows and 5 deer. I, also, saw some robins along the creek. I told Laurie I had an urge to walk in the snow. I looked out the window and the landscape around the home looked beautiful from the freshly falling snow. We watched CSI and at 10:00 P.M. I bundled up and headed out the door for a walk of unknown destination. accompanying me on this trek was my wide-brimmed hat; a camera and my Tost Stick. Never heard of a Tost Stick? In simple terms it is a sassafras walking stick given to me by my friend Randy Tost. The handle has a section of leather that fits my hand well and I planned to, also, use it for stability for my camera. The night-time walk began the way I wanted it to… traffic was non-existent! 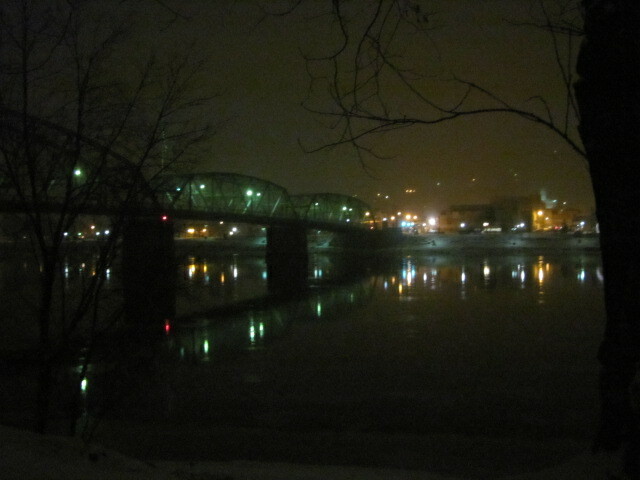 I walked the entire length of Pine Hill Road in West Kittanning, Pennsylvania before crossing the Citizen’s Bridge over the Allegheny River. 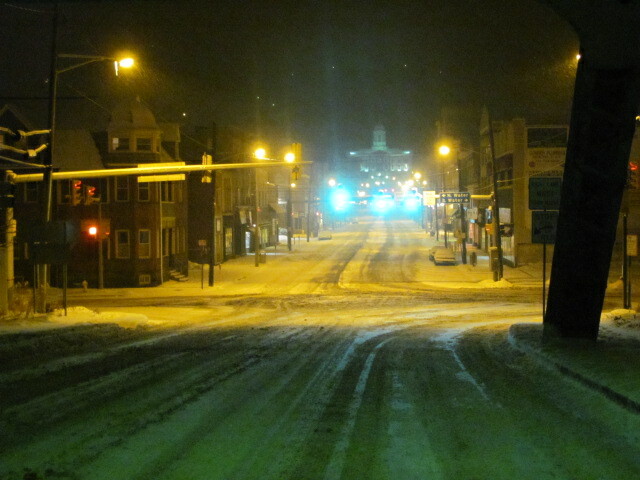 The walk continued into Kittanning before once again reversing the walk. 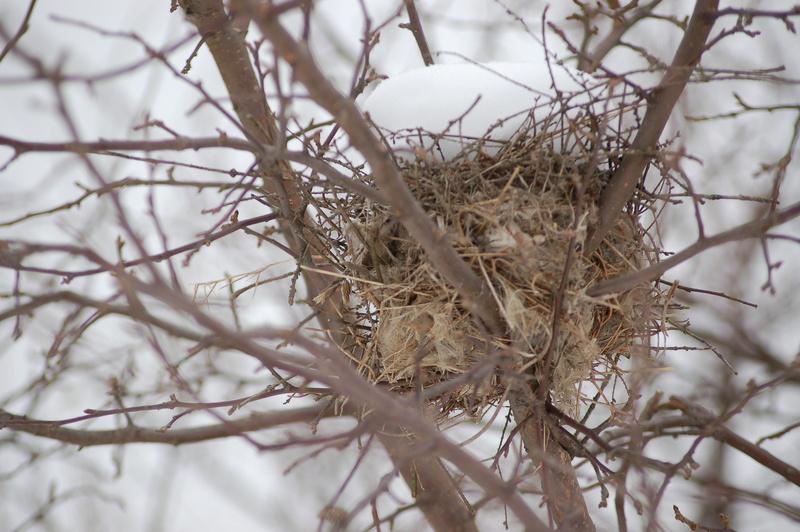 I have mentioned in previous blogs about the beauty of a windless, snowy environment. I stopped more than once to listen and take in the solitude…the peacefulness.. and the quiet. These are seldom experienced in this area and I was “absorbing it all in” and totally enjoying the evening! 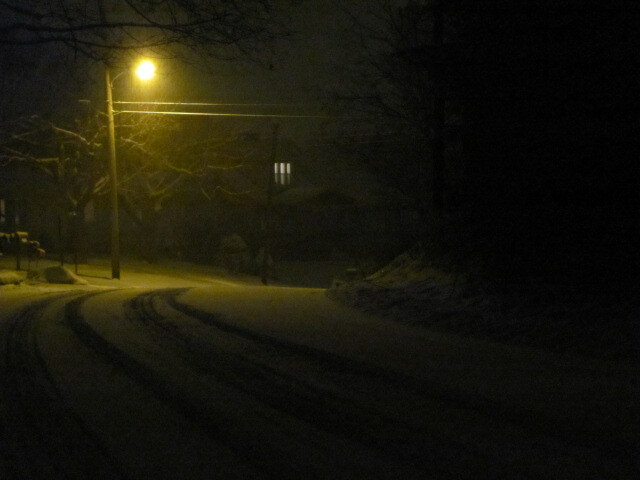 I returned home at midnight completely white from the snow. The only disadvantage of the hike was the fact that I had difficulty falling asleep. I felt invigorated from the 4 mile travel. I recommend this kind of walk to all. 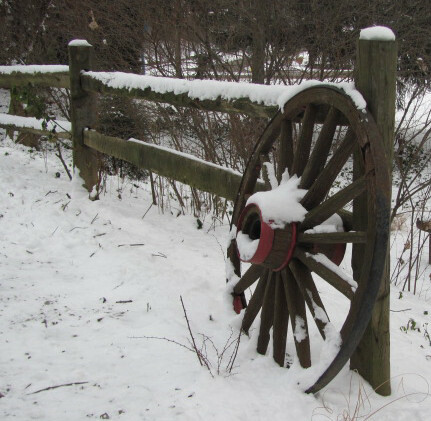 If you are fortunate to live in a rural area the time out in the snow will be even more enjoyable. I used to do these walks often in my younger days living in a more rural area of the county. As for photos, I had some success despite not using a tripod. The colors are beautiful. 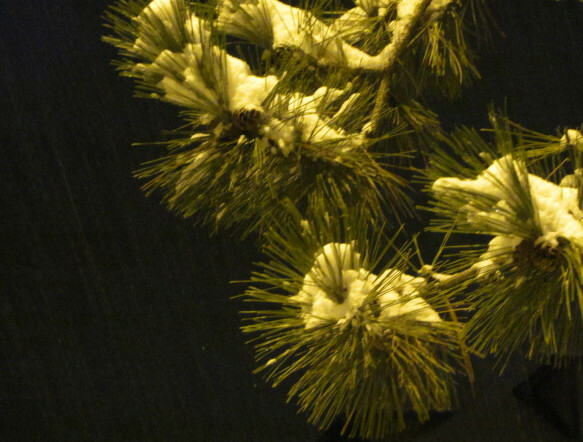 The amount of snow falling somewhat softened the images. 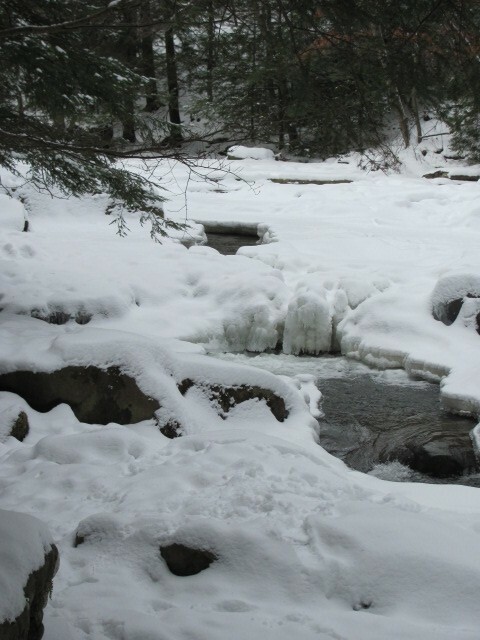 My good friend, Frank Maus and I planned for this winter hike despite the cold temperatures. 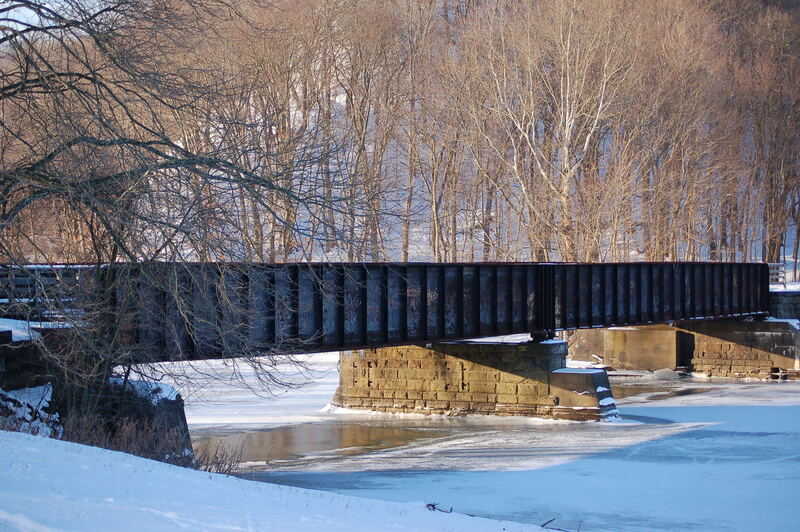 The trek’s beginning was at Rosston, Pa at the site where Crooked Creek enpties into the mighty Allegheny River. The hike would takes us south past the site of the old community of Logansport. The small village is now gone and all that is present is coal mining operations. 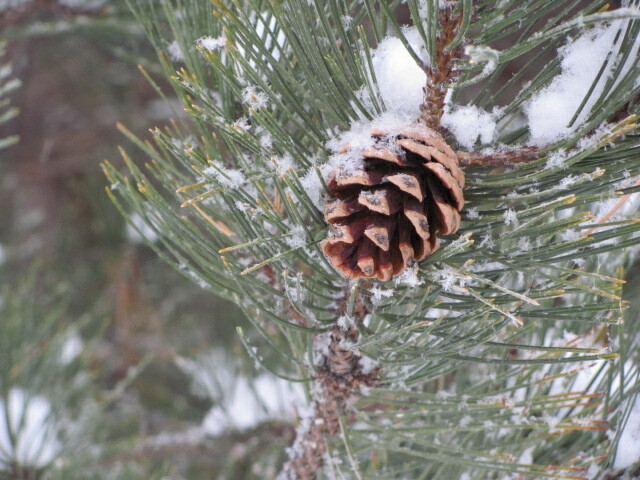 The temperature in the morning was single digit number around 7 degrees. Being the hardy (some may say stupid) individuals we just bundled appropriately and headed off for the approximately 5 mile hike. 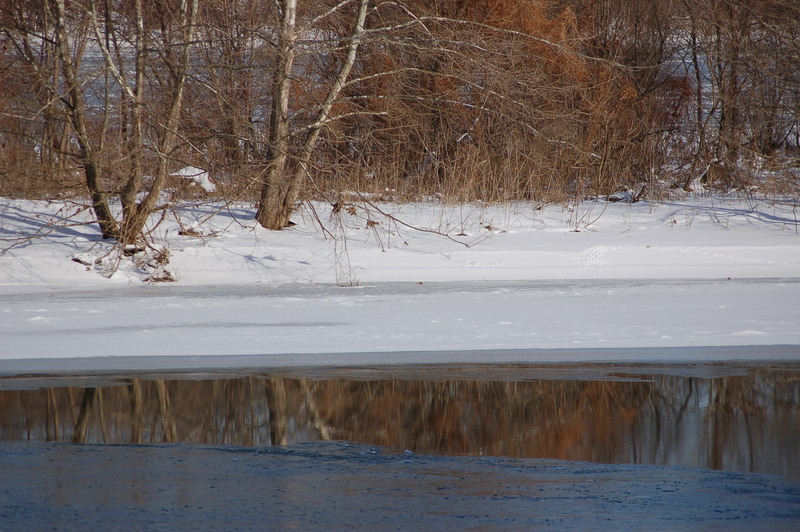 The river was about 99% frozen over. We pointed out the number of tracks on the ice and snow as deer, fox and coyote cross from one side to the other. The walk began with the crossing on the rails to trail bridge built on the old 1902 railroad bridge. The first thing of interest were the number of deer tracks utilizing this bridge. Frank told me of a hunt of chasing deer and when he was following them was uncertain as to where they went. Their tracks told the tale! 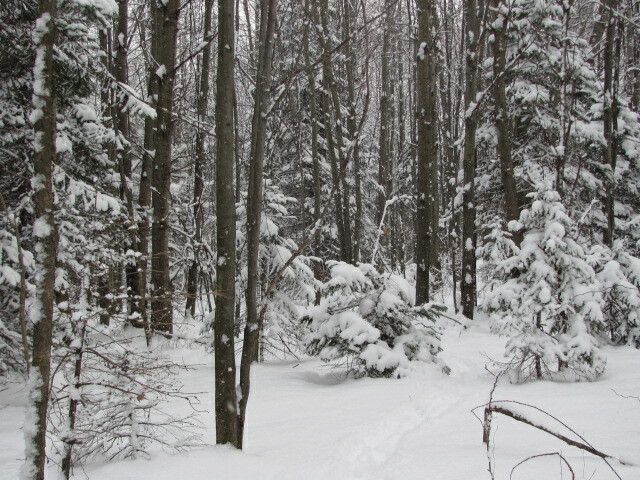 We continued south on the trail forcing our boots through the eight inches of snow. We discussed the various sights as we walked. At one point we stopped to gaze upon the rocky outcrops and some fox tracks when the red fox suddenly ran out along the high side. We saw it go back and forth three times. Later on I could see movement high in a tree. We shortly decided we were seeing a balloon. The walk proved to be a “gab” session as well as a walk! We talked hunting and fishing. Frankie and I fish occasionally together for muskies on the river. As usual our topics end up with laughs over the place we worked those 30 plus years and the fellows we worked with. Always a howl!! Other critter observations of the morning were some geese circling an open area of water; cardinals; and some crows. The morning hunt began around 8:30. I have been blessed with the ability to observe and enjoy the beauty winter has to offer. 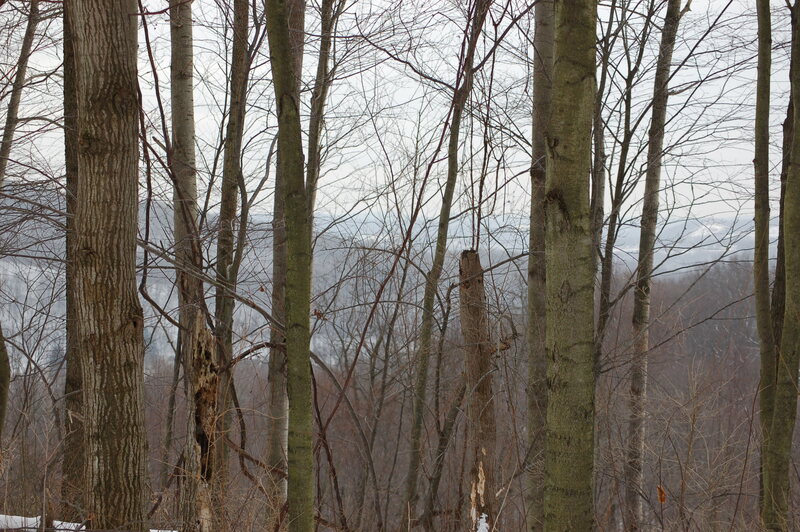 As I walked about, I peered over one hill and was granted the privilege if watching a buck edge down a hollow. I could readily see it’s rack, but couldn’t count points as usual. I hoped this deer would circle around towards Bob. The snow averaged 8-12 inches on the ground. I was concerned with Bob hunting in such conditions so I purposely kept him on the flat areas of the hill. I elected to try push deer uphill as much as possible. I was sneaking along and spotted a deer in its bed. 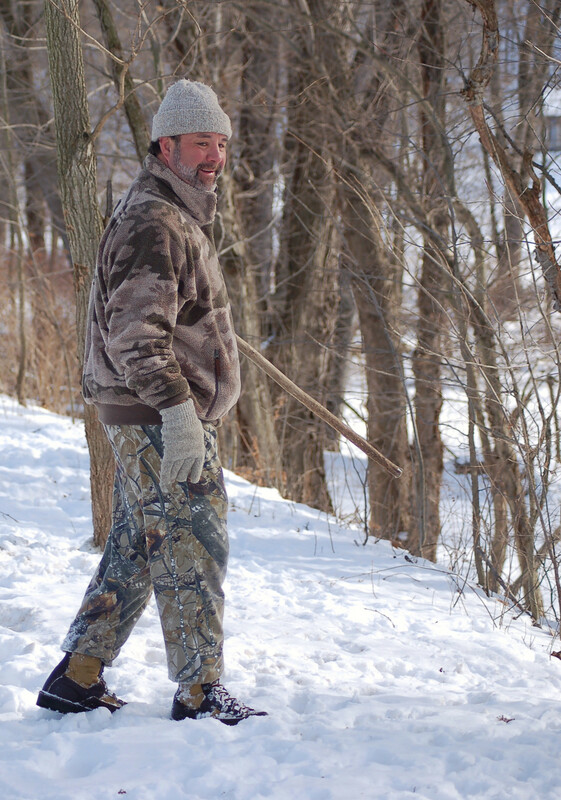 I crept to about 40 yards before the doe bolted and headed directly towards Bob. 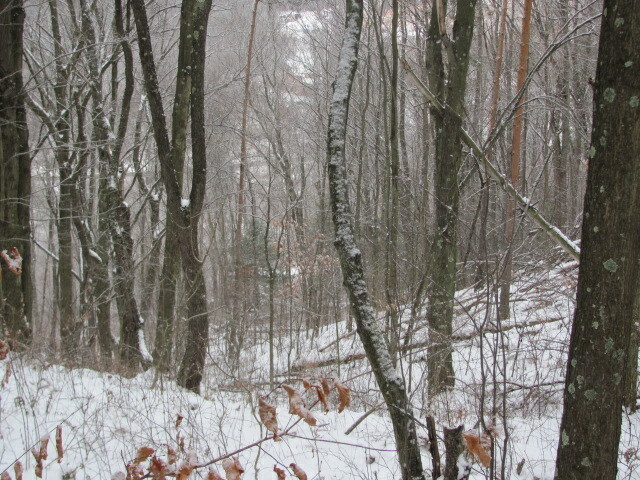 Shortly, the deer turned and walked about 80 yards below him amongst thick brush. I managed to get a photo, but unfortunately it was blurred. Later, I spotted another deer about 80 yards below me in its bed. I debated back-tracking to see if we could sneak back allowing Bob a shot. The deer spotted me and left hurriedly. Two other deer emerged about 10 yards from me from among a blow-down. Later, I watched a deer sneak out of a briar area. I followed it straight towards Bob. I jokingly asked him if he had a silencer on his flintlock since I hadn’t heard the shot. Bob, elected to not shoot hoping for a better broadside shot. I commended him for not shooting if the shot didn’t feel right. All told I saw 14 deer sightings including three in their beds. Bob saw two. We quit around noon and headed home for some grub. The morning was a good one! I take photos of landscapes for my memories. I hope you can find some enjoyment with them. 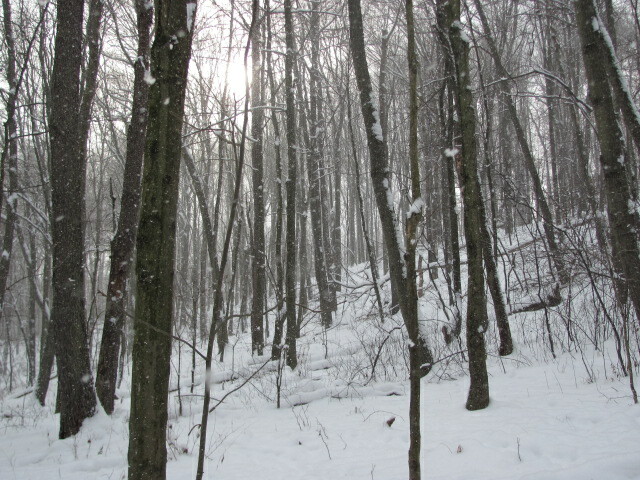 Laurie and I decided to take to the fields behind the house for a nice hike in the snow. 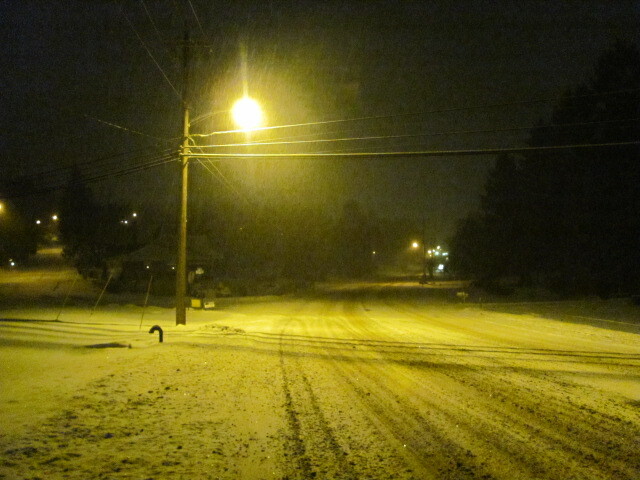 There is something about walking in a snow on windless day (or night) that is good for the spirit. The walk was an ascension up and over the hill behind the house. 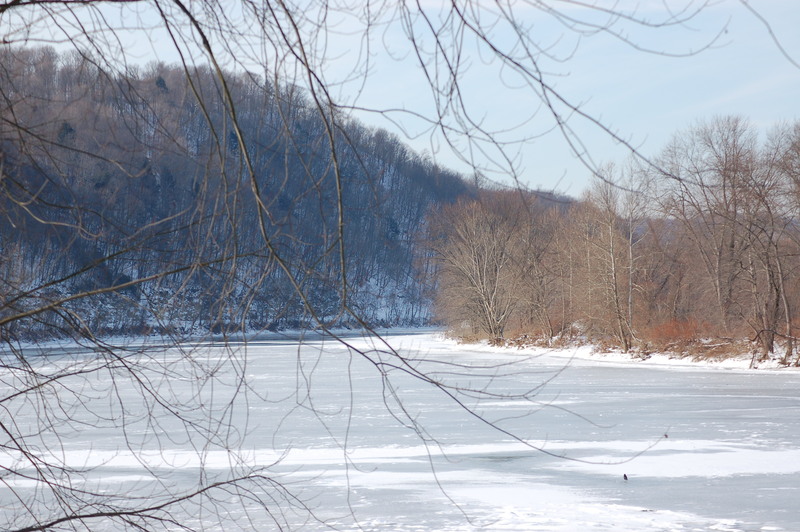 From this vantage point on a clear day one can see across the Allegheny River onto distant hills and hollows. This is an enjoyable view. Today we could just make out the outline of the hills due to the snow. 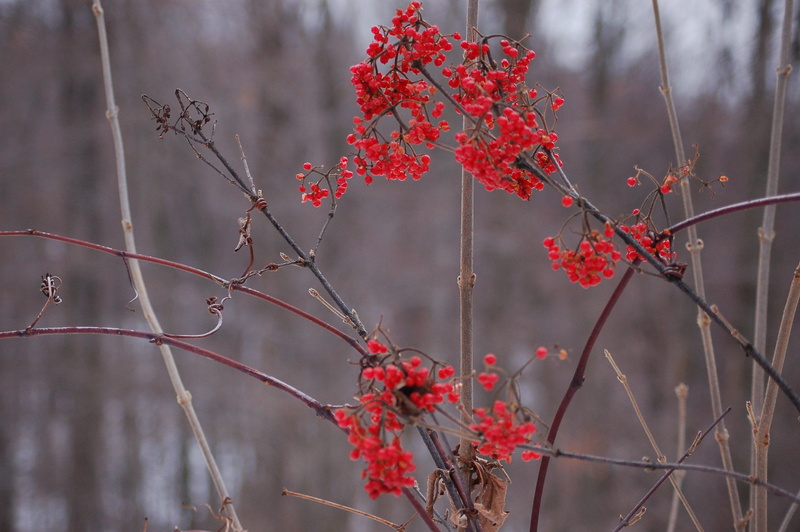 We continued our walk along a long ago abandoned field covered with sumac, goldenrod, briars and young oaks. As we walked along I was talking about seeing plenty of fox tracks in this area a few weeks ago. Suddenly, a fox ran towards us at about 200 yards along the same border. But wait… that isn’t a fox! The animal proved to be a coyote! A ‘yote sighting is always a wonderful critter to observe. 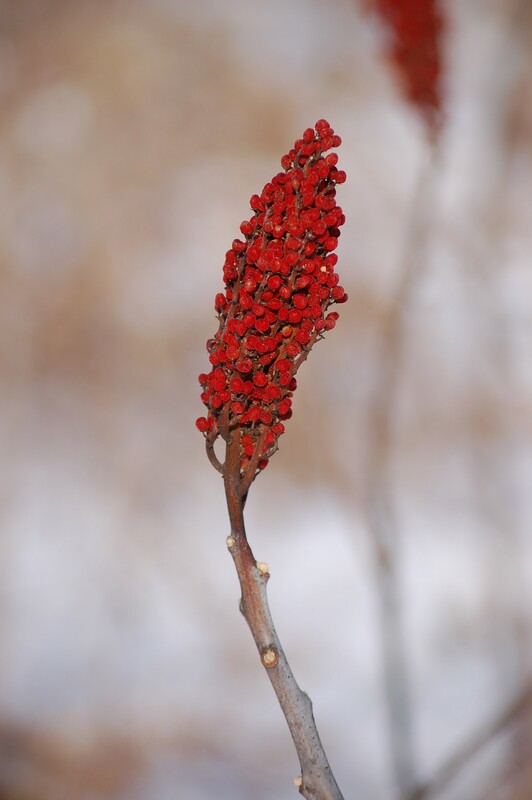 We walked around to see an area I called the “field of red” where a number of staghorn sumac thrive and grow. 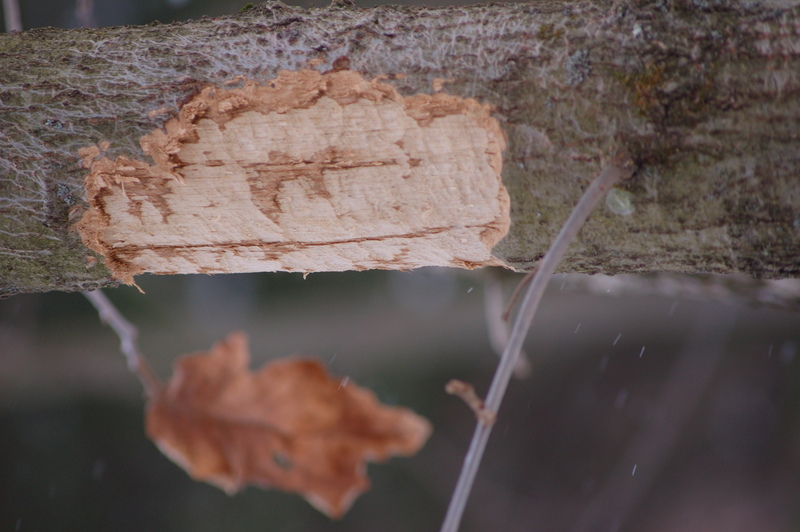 When the cottontail rabbit was a plentiful animal I would annually see where they would chew the bark from sumac where I grew up. On New Year’s Day, Susie (my springer spaniel) and I were outside. I had erected two brush piles for a rabbit that was traveling in the area to my feeders. Upon completion of these piles we were walking towards the house when I looked along the creek and a red fox was traveling past. This is the second time I have seen a red fox here and behind the house. I have been a “slacker” with my blog in recent days. 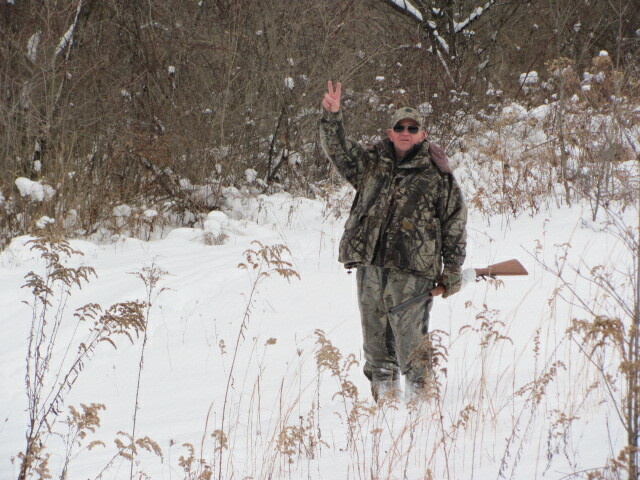 Last week on January 5, my cousin Donnie Smail and I spent some quality time afield in pursuit of white-tail chasing. Donnie and I were out of deer tags so we were “dogging” for my step-father Bob. (Donnie and I are as close as being brothers as one can be without actually being bros. Our fathers were brothers and our mothers were sisters.) That is important information to know, but, I don’t know why. Don’t let this information out, but, I kind of like him. Bob, on the other hand, finds much difficulty dealing with the two of us as we harass him throughout our time together. The second deer drive moved deer towards Bob. The deer raced past him and he couldn’t get a shot. The third drive produced some deer movement past him. These deer , also, were in high gear. Needless to say, Bob urged us to slow the deer down in the future. We stopped hunting around noon. 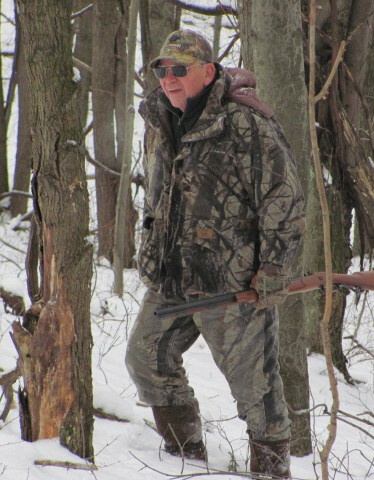 Today, January 10, Bob and I braved the 10 degree temperature to seek some deer activity. The early walk along a gas road revealed some deer tracks. That looked promising! We approached a field’s edge and were blessed to see a flock of wild turkeys already feasting on acorns from bordering oak trees. The flock of 12-15 birds erupted into the air sailing for the hollow. 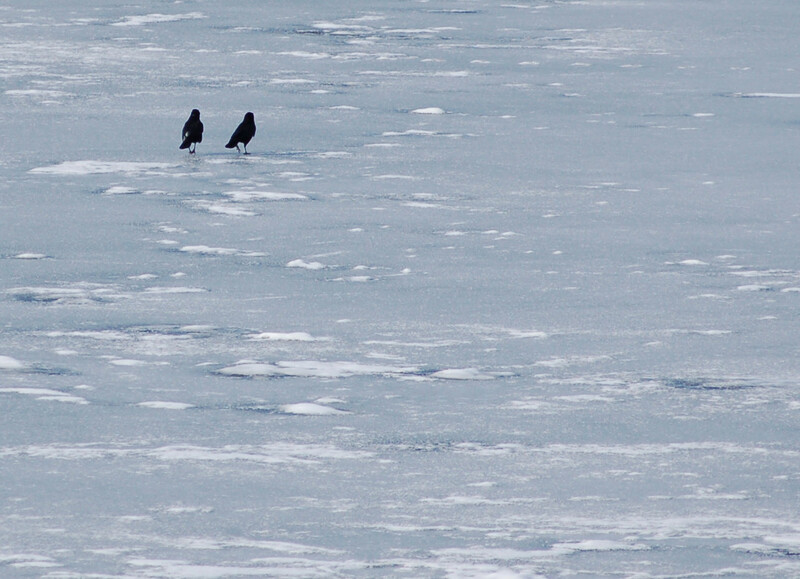 We would occasionally see a bird as we hunted the area. The morning was witnessed by windless time. The softly falling snow created a peaceful solitude I crave to be part of. The problems of life seem small with the natural world enveloped in such a scenario…. Beautiful time afield! The first drive, produced some deer past Bob. He saw two deer sneaking along out of range. We walked around together with more deer sightings. 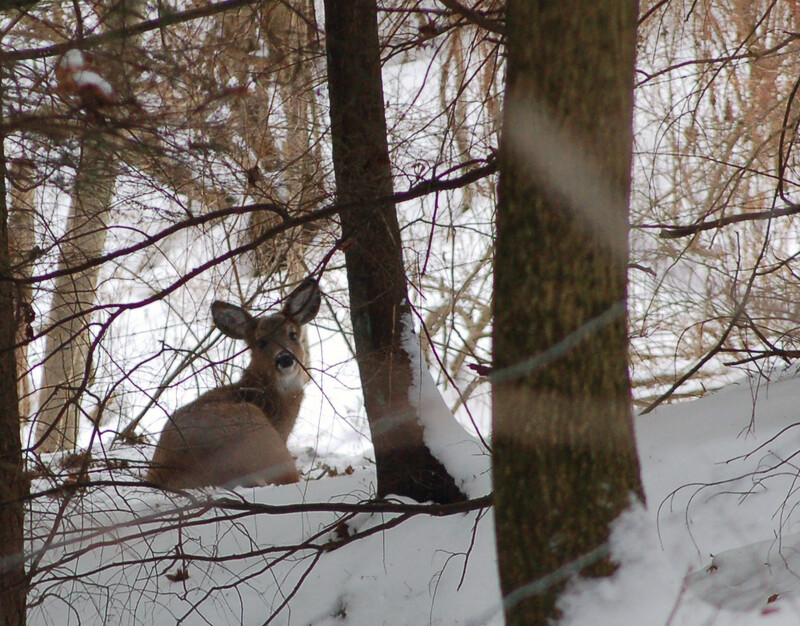 I peered over the edge of the hill watching three deer feeding along. I saw a couple of fox squirrels too. The remainder of the morning saw a few deer, however, none of which went past Bob. As noon approached, Bob and I began a trek towards his truck. We met and old friend and classmate, Ed Orr. We talked awhile before separating and heading towards home. Later from the pick up, I noticed 5 deer feeding. We watched them for a bit before heading home.